Orchids (Orchidaceae family) are the largest and most diverse of the flowering plant families, with over 800 described genera and 25,000+ species. There are also over 100,000 hybrids and cultivars produced by horticulturalists, created since the introduction of tropical species to Europe. Lifespan of orchid depends on the species. Certain species can survive up to 100 years. Orchids are found on all continents except Antarctica. The great majority are to be found in the tropics, mostly Asia, South America, and Central America. Some are found above the Arctic Circle, in southern Patagonia, and even on Macquarie Island, close to Antarctica. Orchids are very old plants. According to the fossil evidences, orchids exist on the planet around 100 million years. Orchids can live on the ground (terrestrial forms), attached to woody plants (epiphytic types) or even thrive under the ground. A majority of species are epiphytic types. These are anchored on other plants, mostly trees, sometimes shrubs. However, they are not parasites. Vanilla is one of the best known and widely used flavors. It is extracted from the pod of Vanilla planifolia, which is a species of orchid. Orchids do not have classic root. They have rhizome, tuber or aerial roots. Size, shape and texture of leaves depend on the habitat. Orchids that live in dry climate have thick leaves covered with wax, while species that live in warm and humid areas have thin, elongated leaves. Certain species of orchids do not have leaves at all. Some orchids have single flowers, but most have a racemose inflorescence, sometimes with a large number of flowers. Each flower is bilateral symmetric, which means that it can be divided in two equal parts. People use orchids for numerous purposes. Substances isolated from orchids are used in industry of perfumes, spices and in traditional Asian medicine. All orchids have inferior ovaries which develop into a capsule with (usually six) compartments containing up to millions of microscopic seeds. Only few seeds will develop into mature plant. The flowers are pollinated by insects, in some cases by birds, and it is common for flowers to have petals modified into perches or guides for their pollinators. Orchids have a dizzying array of pollination syndromes, some fantastically complex. Seed of orchids does not have endosperm which provides nutrients required for the germination. Because of that, all orchids (including non parasitic forms) live in symbiosis with fungi during germination. Germination can last from couple of weeks to 15 years. Orchids produce several millions of miniature seeds. Only few seeds will develop into mature plant. Orchid species can differ greatly from one another, with extreme variations in size, weight and color. Flower of orchid can survive from few hours to 6 months, depending on the species. millimeter (0.02 inches) . The tiny bloom was initially mistaken for a fungus before being examined under a microscope at the Federal University of Santa Catarina in the south of the country. Due to high specialization of pollination, extinction of insect means extinction of orchid (there is no one else who can pollinate it in the wild). Bond between orchids and certain species of insects is tight and highly specialized. Petals have similar shape and color like female insects to attract males and ensure pollination. The previously recorded smallest orchid flower was identified in 2009, measuring 2.1 mm (0,08 inches) and was discovered in the mountain forests of Ecuador. Certain species of orchids are parasitic. They are not able to produce food (sugar) using the sunlight and carbon dioxide (like other plants). Instead, they obtain food from fungi that live inside their roots. Grammatophyllum speciosum, also called giant orchid, tiger orchid, sugar cane orchid or queen of the orchids, is the world’s largest orchid. Its cylindric pseudobulbs can grow to a length of 2.5 meters (8.2 feet) . It can grow to gigantic clusters weighing from several hundred kilograms to more than one ton. Each raceme can grow to a height of 3 meters (9.8 feet) , bearing up to eighty flowers, each 10 cm (3.9 inches) wide. Shenzhen Nongke Orchid, most expensive flower ever sold – This orchid flowers only blooms once every 4 to 5 years and takes its name from the university at which it was developed. Scientists spent 8 years creating the delicate bloom which fetched a staggering $200,000 at auction in 2005. It remains the most expensive flower ever sold. Orchids can live on the ground (terrestrial forms), attached to woody plants (epiphytic types) or under the ground. Priceless Orchid – Few living things are both as poetic and ephemeral as the Kadupul flower, a fleeting beauty from Sri Lanka that blooms as infrequently as once a year. And when it does bloom, it does so in the dark of night and withers away before dawn … so transient, it simply can’t be purchased. Flower of orchid can survive from few hours to six months, depending on the species. Many orchid plants bloom only once a year, though some varieties bloom a few times. Lifespan of orchid depends on the species. Orchids can have single flower or racemose inflorescence. Each flower is bilateral symmetric, which means that it can be divided in two equal parts. Healthy plants that have been cultivated with a consistent fertilizer and watering regimen will survive in a garden for 20 years or longer. Some wild orchids have been known thrive for as long as 200 years. Orchids have a reputation for beauty and mystery and have long been cultivated. 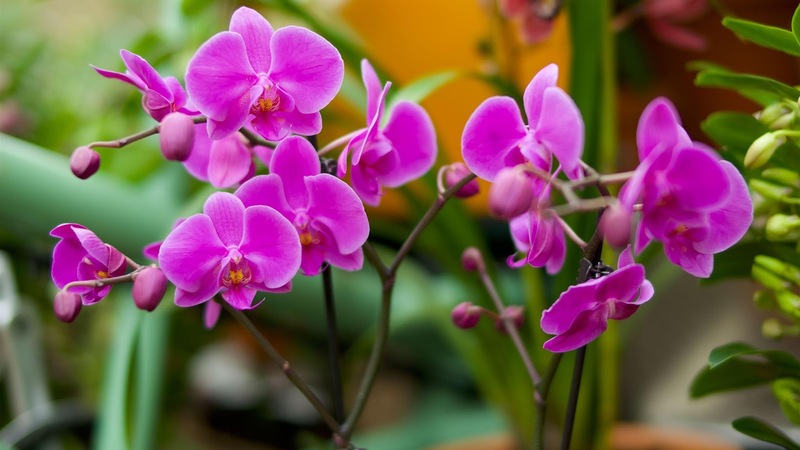 Orchids have been cultivated for over three thousand years, starting in China. Size of orchids depends on the species. They can be tiny as a penny or extremely large, weighing couple of hundred pounds. The scent of orchids is frequently analysed by perfumers to identify potential fragrance chemicals. Orchids have been used in traditional medicine in an effort to treat many diseases and ailments. They have been used as a source of herbal remedies in China. Biologists at Harvard University have identified the ancient fossilized remains of a pollen-bearing bee as the first hint of orchids in the fossil record, a find they say suggests orchids are old enough to have coexisted with dinosaurs. Their analysis in the journal Nature, indicates orchids arose some 76 to 84 million years ago, much longer ago than many scientists had estimated. Many wild orchid species are threatened by people collecting them for sale to orchid fanciers and nurseries. Many are also threatened by the destruction of their habitat by logging and forest clearing.